The weather is heating up, and salad days are almost upon us! If you’re in Queensland like we are, the entertaining season has started already. Spring afternoons fill with barbeques and alfresco dinners with friends. These dinners don’t have to be fancy and mostly consist of a few good salads and your choice of protein. It’s right about this time that we go looking for new salads to add to our repertoire, bringing something fresh and interesting to the table. Enter halloumi. The perfect salty, squeaky friend which jazzes up the plainest salad and makes it look like you meant it. 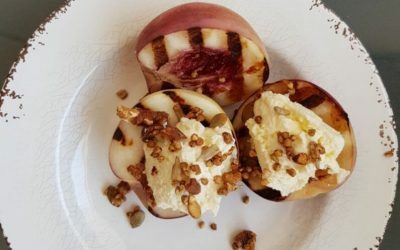 At Olympus Cheese, we are always on the lookout for the best salad recipes for Olympus halloumi. We’ve rounded up our favourites for you. Make the bulk of the salad itself ahead of time, adding perfectly pan-fried halloumi at the last minute just before serving. When you add chorizo to halloumi, you get the most decadent, salty deliciousness you could imagine. If you’re looking to make it go further than from pan to mouth, bulk it up with some salad ingredients. The strong flavours pair well with salad greens and balance well with the addition of mint. 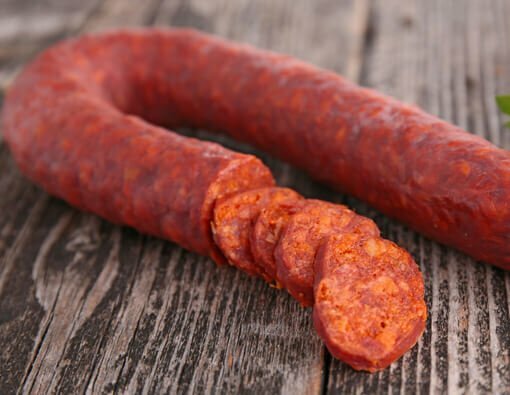 Our favourite uses a good quality chorizo along with spinach, rocket, halved cherry tomatoes and mint. Drizzle with a balsamic reduction which cuts through the salty flavours. If you would prefer a recipe to make we love this recipe for Spinach, chorizo and halloumi salad by BBC Good Food which adds asparagus. Watermelon and halloumi work so beautifully together, they need very little else. 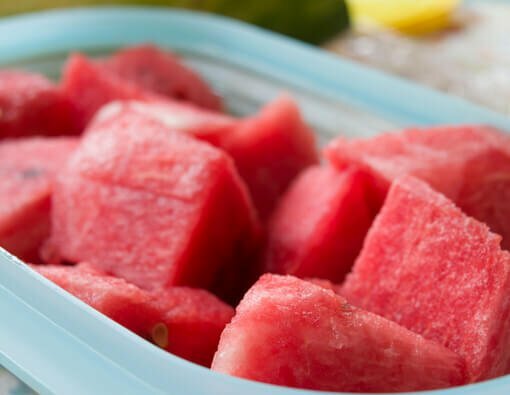 The sweetness of refreshing watermelon is the perfect combination for the salty halloumi. We love the simplicity of Matt Moran’s fried halloumi and watermelon salad with fresh mint. The little hint of chilli he brings to this dish works really well to give it that extra zing. If you’re looking for an extra salad for a get together that’s a bit of a wow dish, this is your guy. Continuing on our fruit combinations, we give you the juicy, flavourful pomegranate. 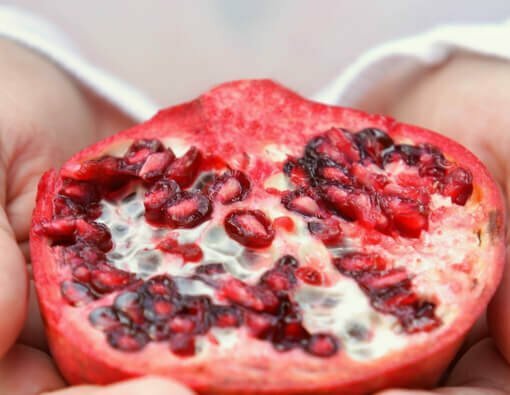 If you haven’t tried pomegranate seeds, you must this season. 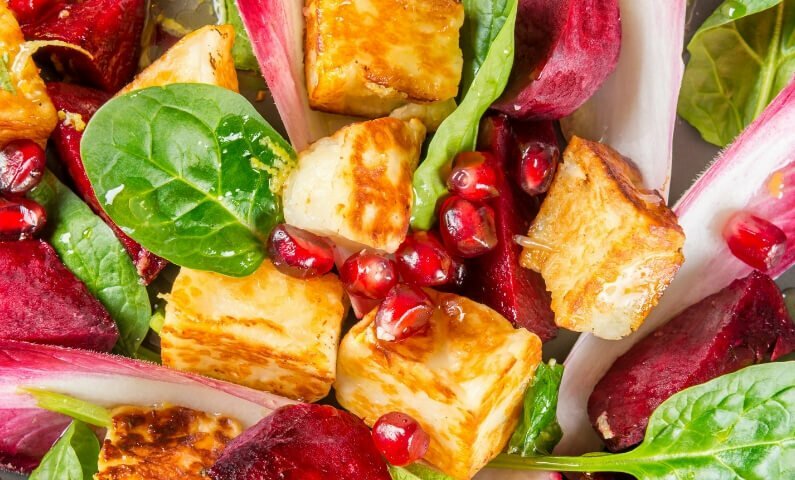 Give yourself every excuse by making a delectable pomegranate and halloumi salad. It is no accident why these little jewels of goodness cover the halloumi fries of some of the best restaurants around the world. The flavours work so well together. Try this version by the Australian Women’s Weekly’s quinoa salad with halloumi and pomegranate. Sweet, spicy, salty, tangy and altogether delicious! The addition of quinoa allows the salad to go further and adds a nuttiness which is very more-ish. 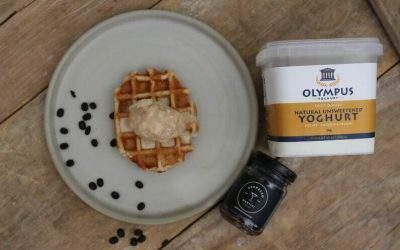 Plus you can also use up your tub of Olympus Greek Unsweetened Yoghurt to serve! 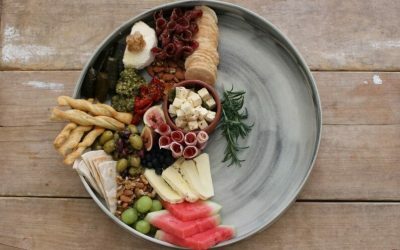 Have you ever tried harissa paste? 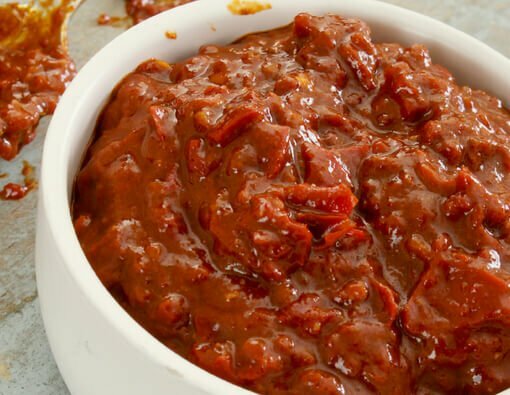 It is a Middle Eastern and North African sauce which has a hot, smoky, earthy flavour. It is made by blending chillies into a thick paste with garlic, oil and spices. Harissa is one of those strong flavours which pairs beautifully with the saltiness of halloumi. In this combination of golden harissa-dressed halloumi salad by Gousto, the pair are sat on a bed of baby greens and caramelised onion and yellow capsicum. You can find harissa in most delis and supermarkets, or you can make your own. 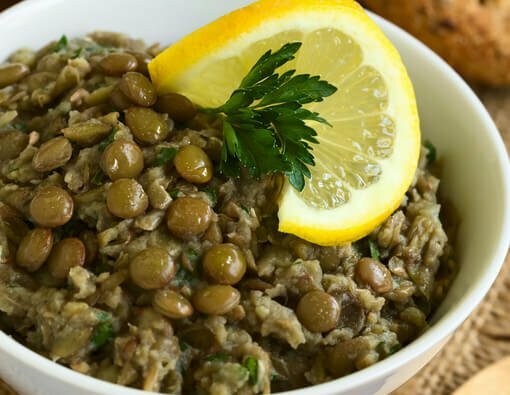 For a healthy Mediterranean style salad, you can’t go past delicious lentils with your halloumi. We love the version made by BBC Good Food – halloumi with lemony lentils, chickpeas and beets. This salad will go a long way. It perfectly combines the earthiness of lentils with nutty chickpeas and beets. Then it gives you a big burst of lemon to cut through the saltiness of halloumi and capers. So there you have it, 5 new delicious salads to try this season using Olympus halloumi!